Kenyan distance runner David Rudisha and American volleyball player Foluke Akinradewo earned the United States Sports Academy’s Male and Female Athlete of the Month honors for August. 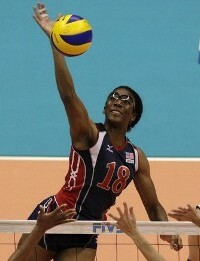 Akinradewo, Stanford University’s assistant women’s volleyball coach, captured the Most Valuable Player and Best Blocker awards as the United States landed its third FIVB World Grand Prix title with a perfect 5-0 record, sweeping Japan in the Americans’ last match at the six-team round-robin. 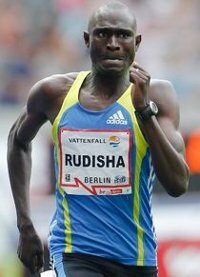 Rudisha broke the world record in the 800 meters twice in one week. He clocked 1:41.09 in the event at an international meet in Berlin, Germany on 22 August. The previous record of 1:41:11 – set by another Kenyan-born athlete, Wilson Kipketer – had stood since 1997. He broke the record again at the Riediti (Italy) Grand Prix meet with a time of 1:41.01 on 29 August. Tyson Gay finished second to Rudisha in the male voting after he earned the Samsung Diamond League trophy as the season’s top performer in the 100-meter dash. The American ran the 100 in 9.79 seconds to beat Jamaican Nesta Carter in the final meet of the series in Brussels, Belgium. The 2007 world 100 and 200-meter champion ran a world-leading 9.78 two weeks earlier in London. Another American sprinter, Allyson Felix, finished second in the female balloting after she won the Diamond League championship in both the 200 and 400 meters. After finishing second in New York in the 200, Felix won her last four stops on the tour in that event. Her best time on the tour was 22.03 seconds. In the 400, Felix completed her double championship by winning the women’s 400 meters in 50.79 at the Belgacom Memorial Van Damme in Belgium. Her best 400 time was 50.15. American race car driver Kyle Busch finished third in the male balloting. Busch became the first tripleheader winner in NASCAR history, sweeping the Sprint Cup, Nationwide, and Camping World events at Bristol (Tenn.) Motor Speedway. His final win at Bristol was the Irwin Tools Night Race on 21 August. He made it four NASCAR victories in a row by winning the Camping World Truck Series in Chicago the following week. WNBA star Diana Taurasi of the Phoenix Mercury finished third in the female balloting. The American basketball star from Connecticut won the WNBA scoring title with 22.6 points per game. She scored 23 in the Mercury’s series, clinching a 92-73 victory over the San Antonio Silver Stars in the first round of the Western Conference playoffs.